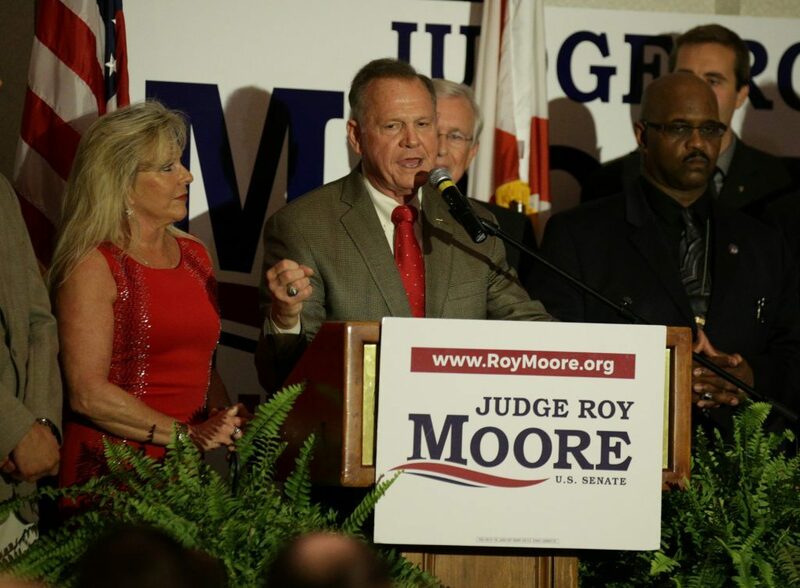 27 Sep, 2017 by	Margaret M.
“We are proud to have fought alongside President Trump and the NRA,” said Roy Moore in his victory speech last night. His defeat of Luther Strange in the primary race to become the Republican’s candidate for the Senate seat left open by Jeff Sessions has been national news, with the left-wing press trying their darnedest to turn it into an anti-Trump narrative and the rest of us just wondering why the Alabamans are doing such a good job of being respectful to all involved. Trump had backed Luther Strange while his ex-White House coach Steve Bannon headed up the campaign for Roy Moore. Last night, Bannon declared the win to be the start of a revolution for insurgent Republicans in the lead-up to the 2018 senate races. If Luther Strange wins, then Trump is a big bully. If Roy Moore wins, then the base hates Trump and is rejecting his choice. A few days ago, Trump himself called into the popular radio show “Rick and Bubba” before he was scheduled to appear at a Huntsville rally supporting Luther Strange, where he expressed that Strange would be a great Senator who loves his state and country. I’m sure Trump has the full intention to work with Roy. During the primaries he attacked every one of his opponents and now not only gets along with guys like Ted Cruz, but he has entrusted the entire HUD portfolio to Dr. Ben Carson. Trump doesn’t hold grudges as long as both sides are willing to work for their electorate instead of themselves. Incidentally, Dr. Ben Carson endorsed Roy Moore, too. Here’s the ten-minute victory speech by Roy Moore, as introduced by Steve Bannon, who every day looks more and more like an exhausted film director.